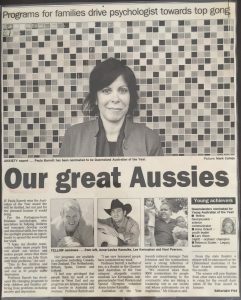 This is an article from Courier Mail and it is about when Dr Paula Barrett was nominated as Queensland Australian of the Year. “If Paula Barrett wins the Australian of the Year award she will be thrilled, but not just for the personal honour it would bring. For the Portuguese-born Brisbane psychologist, who specialises in helping children and teenagers develop social and emotional skills, her time in the spotlight presents an opportunity to spread the word about her work. “I hope my finalist nomination helps more people find out about our service and makes people aware that there are people who can help them with their problems,” she said. Professor Barrett has developed life-changing programs to help children and families suffering from problems including anxiety and depression. Her programs are available in countries including Canada, New Zealand, The Netherlands, Britain, Spain, Greece and Iceland. “I feel very privileged that people think my work (…) and our programs are helping many kids and families in Australia and overseas,” Professor Barrett said. 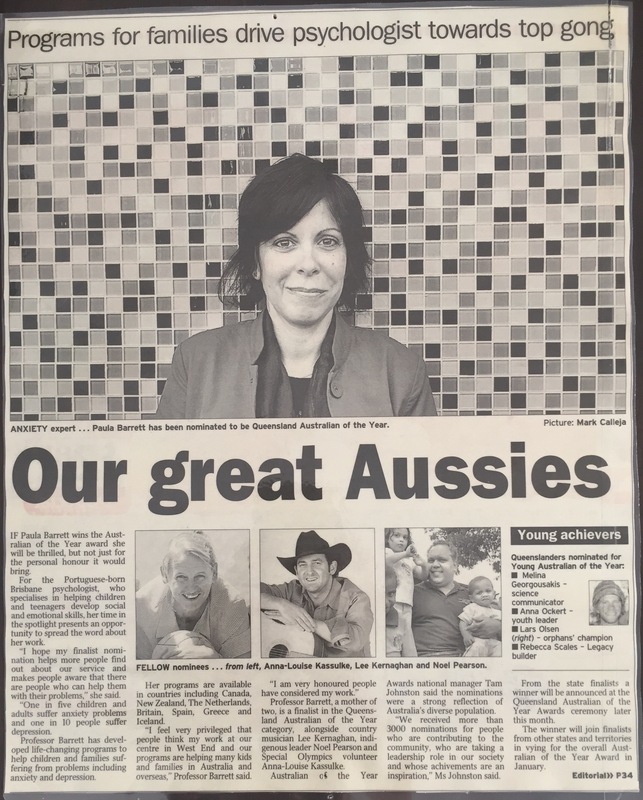 Professor Barrett, a mother of two, is a finalist in the Queensland Australian of the Year category, alongside country musician Lee Kernaghan, indigenous leader Noel Pearson and Special Olympics volunteer Anna-Louise Kassulke. Australian of the Year Awards national manager Tam Johnston said the nominations were a strong reflection of Australia’s diverse population. “We received more than 3000 nominations for people who are contributing to the community, who are taking a leadership role in our society and whose achievements are an inspiration,” Ms Johnston said. From the state finalists a winner will be announced at the Queensland Australian of the Year Awards ceremony later this month.